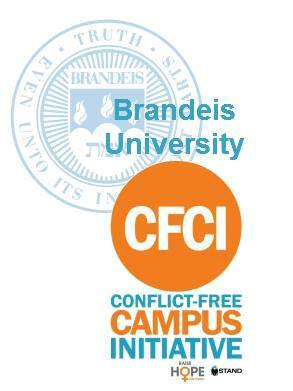 The Brandeis CFCI started in spring 2012 as part of a class project (Advocacy for Policy Change). It became a 3 year educational campaign supported by STAND (Students Against Genocide) chapter and developed into a strong movement calling for administrative policy change for the entire institution. We educated ourselves and our peers. We organized events, connected with faculty, put together speaker panels and documentary showings, collected signatures, lobbied to the State House. We empowered ourselves and our community. We travelled to conferences and met with other activists. We met Congolese immigrants who told us their stories and we were inspired. We are inspired and we want to inspire others. We put together everything we learned in a proposal (attached below) and used it to introduce our movement to the administration at Brandeis University. We want to share this with other universities. We invite you to use and modify our proposal to fit the needs of your school and become conflict-free! In 2015, Brandeis administration recognized the importance of participating in the CFCI and with the help of faculty and staff, we managed to become one of the first CFCI universities in the Northeast! Find us on Facebook; learn more about what helped us become conflict-free! For more information, please visit our Conflict-Free Campus Initiative Page. To join the CFCI, please visit the Enough Project's Raise Hope for Congo page.